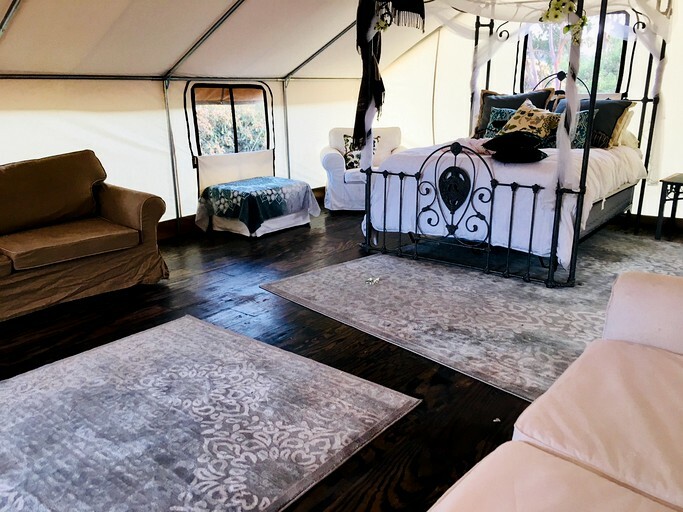 This luxury safari tent is ideal for an unforgettable glamping getaway in North San Diego County, California. This unique retreat can accommodate up to six guests, making it perfect for a one-of-a-kind group or family vacation. Inside, visitors will find one queen-size canopy bed, as well as two full-size pull-out couches. 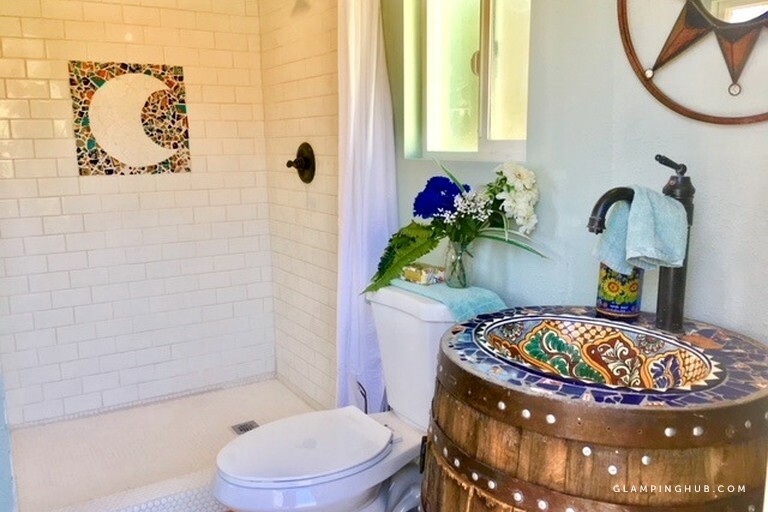 Guests will also have a private locking bathroom located just outside the tent, which comes with elegant and colorful mosaic work, a toilet, a sink, and a shower. Linens and towels are provided by the hosts. 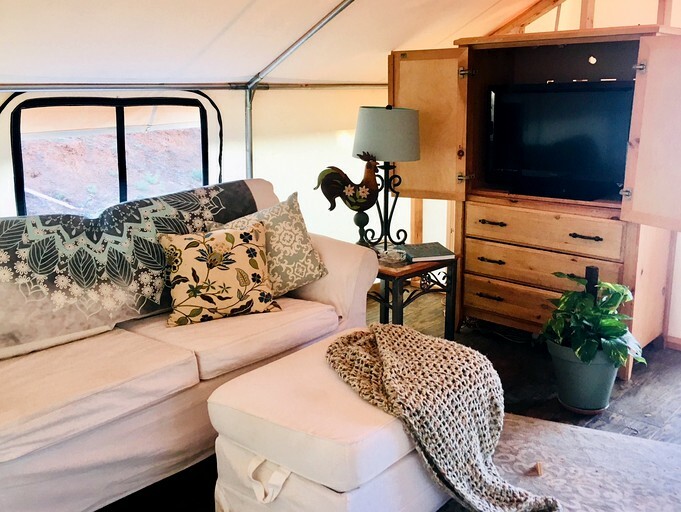 The living space in the tent is also beautifully decorated and boasts comfy seating and a flat-screen TV which makes the area ideal for some relaxation after a day of adventure. 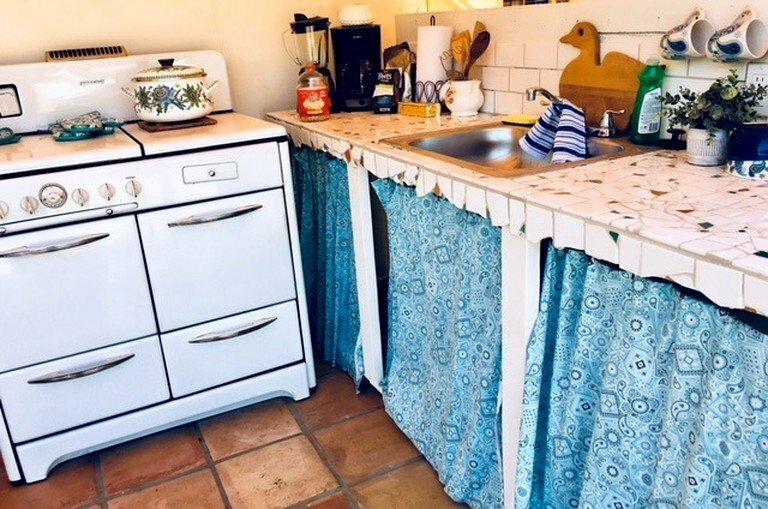 The vintage outdoor kitchen boasts its own charm and comes with a stove, a griddle, an oven, a blender, a juicer, a waffle iron, a coffeemaker, a popcorn maker, and more. Guests will have no problem cooking up some tasty treats while surrounded by the sights and sounds of nature. 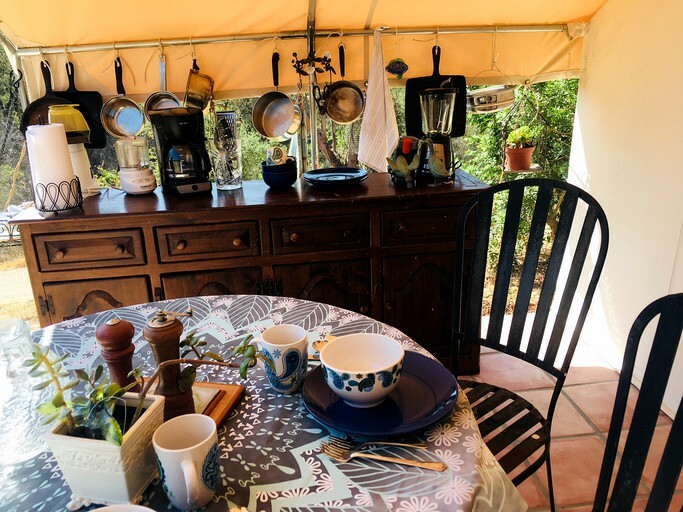 The hosts even kindly stock the covered outdoor kitchen with farm eggs and other necessities. 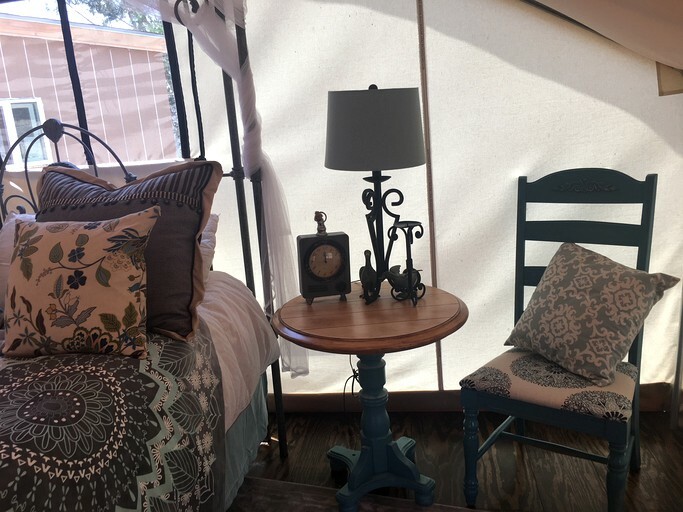 Other handy amenities include Wi-Fi, free parking, a delicious breakfast each day, and smart locks for both the tent and the bathroom. Glampers can relax and unwind in the hot tub available for them, as well as plenty of facilities and attractions around the area and the farm itself, where guests can explore the country life. The host generously stocks the accommodation with breakfast items, including the farm's own chickens' eggs. Guests can come to relax, soak in a private hot tub, and enjoy the night sky, or even to learn a few things! 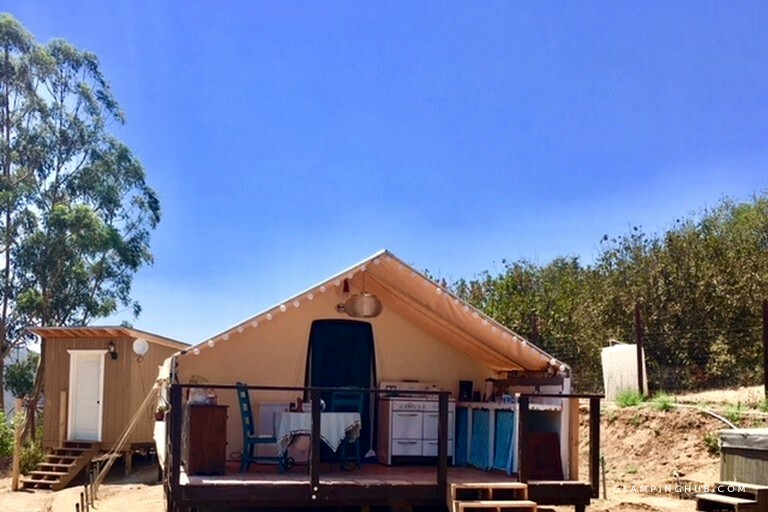 The farm offers cheesemaking and butter classes, jam and canning classes, and for guests of all ages; the popular hand-churned ice cream activity. 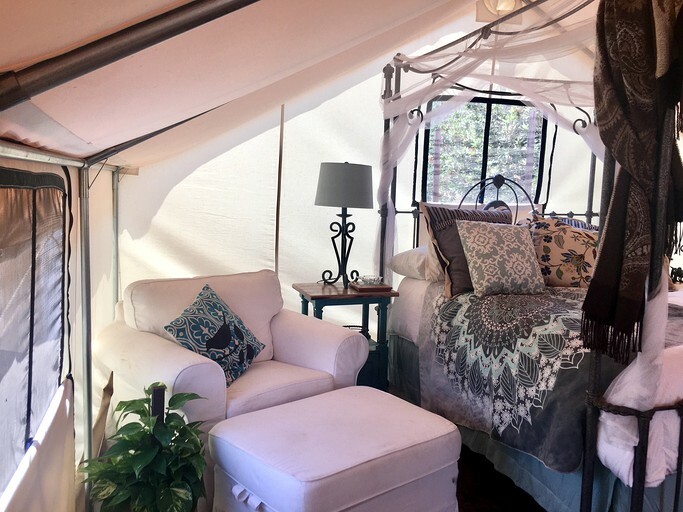 Bird watching, interacting with the friendly miniature Nigerian goats, and the treat-loving alpacas Dusty and Silverado, are just some of the many activities available for visitors during their stay at this glamping site. All the hooved livestock appreciate a granola bar or other crunchy treat; especially Carl the criminal. The gentle miniature Nigerian goats will eat almost anything and Carl the criminal has sworn off stealing from guests but does appreciate Saltine crackers, which is his current favorite nibble. Guests can bring bicycles and enjoy the many miles of dirt roads. Also, they can walk the farm’s main road, which winds through fruiting groves including macadamia, avocado, mulberry, limes, and kumquats. Many guests come for such a short visit they just want to soak up the quiet beauty of this magical spot. The local farmers’ market is on Saturday and is 15 minutes away in Old Town Temecula, which is a destination in itself. The surrounding area has a number of vineyards eager to showcase their wines. Hot air ballooning is also a local wine country favorite. The hosts send a comprehensive food shopping map, as well as their signature activity guides with every booking confirmation. There is so much to do in and around the area for a fun and exciting, yet relaxing getaway. There is a $100 security deposit that will be held on the guest's card at the time of confirmation and released back to their card three days after check-out pending no damages. Check-in is at 3 p.m. to midnight, and check-out is at 11 a.m.; however, the hosts are eager to offer flexible check-in and check-out if doing so does not interfere with another guests’ visit. Guests should inquire upon booking confirmation. The farm is happy to work around glampers' needs. If guests want to meet the hosts when they arrive, they must arrive no later than 7 p.m., as the hosts are farmers and keep farmers' hours. After hours check-in is possible, as long as the host is notified in advance. Pets are not permitted, and smoking is only allowed in designated outdoor areas. Recreational marijuana use is permitted in California, and there is a trusted local dispensary that can deliver to the farm, which is listed in the host's guidebook. If any damage is done to the accommodation, guests will be charged actual cost to repair. Guests are asked to drive carefully once on the farm. If they'd like to interact with the farm's chickens or goats, the hosts will introduce them to the animals and show them how to keep the barn doors secured. Guests can only enter the goat barn with a crew member. Unregistered guests are not allowed; the property's liability policy only extends to official guests from the time they check in to the time they check out.